Just as I turn a corner on the streets of Ipoh in Malaysia, I lock eyes with an old man holding a cup of coffee. We held each other’s gaze. His expression remained amused. Painted across the back of a building, the man is part of Old Town’s new landmarks. Coffee is to Ipoh what tea is to Darjeeling. So, the mural of an old man drinking coffee is not unusual on the streets. Rather, it is a perfect representation of Ipoh and its culture. 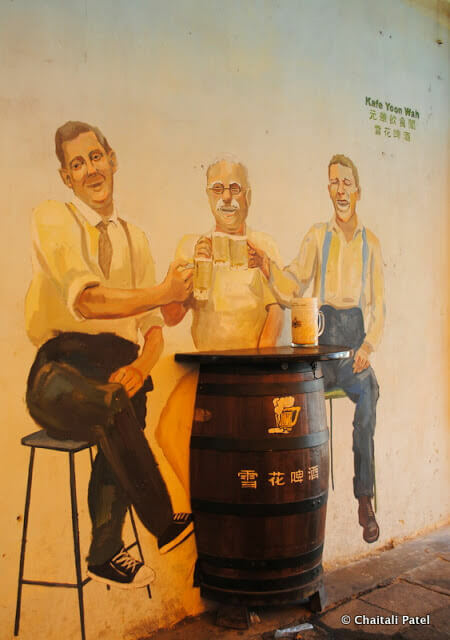 It is in Ipoh’s Old Town that white coffee was first blended to perfection by a Hainanese man named Wong Poh Chew. When Ipoh flourished as a tin oxmining state in the 19th and 20th centuries, a large number of Hainanese immigrated to this region from China. Unaccustomed to the bitter taste of coffee as it was drunk in the city, the Hainanese began to modify the blend to suit their palate. A combination of different coffee beans, roasted, brewed and stirred in a unique way gave rise to white coffee as it is known today. 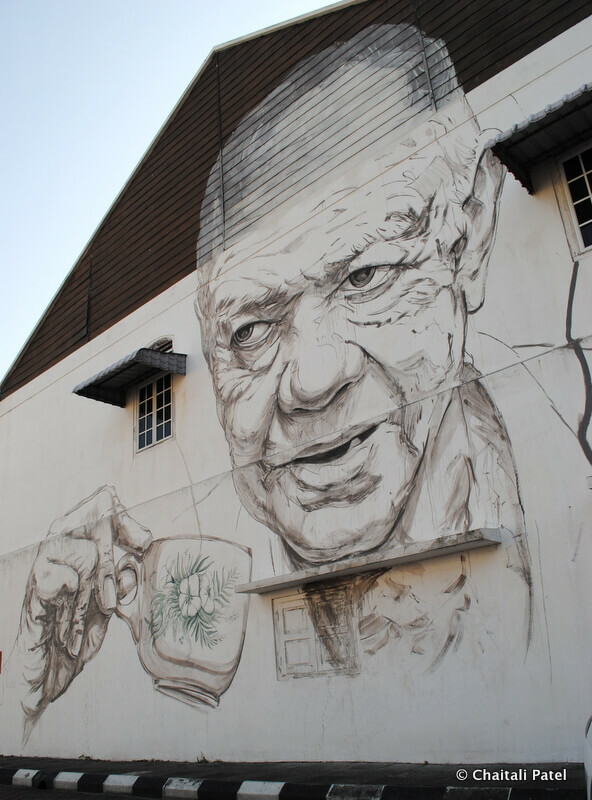 To celebrate this history and heritage of Ipoh, Old Town White Coffee – one of Malaysia’s largest kopi-tiam (coffee shop) restaurant chains – commissioned Lithuanian artist Ernest Zacharevic to create art for the old town. 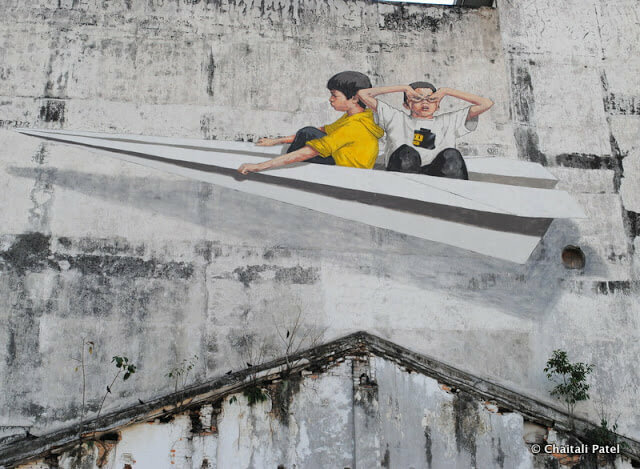 This collaboration has given birth to a set of seven murals painted across Old Town that mirrors Ipoh’s history, culture, hopes, aspirations, concerns and beliefs. A mural is a piece of art that is painted directly on a wall, ceiling or any other large permanent surface. Unlike conventional paintings, they are created in public spaces with the community often witnessing their creation. Zacharevic himself is an ardent coffee lover and likes to drink his coffee out of little plastic packets tied with strings, like the locals do. As I tear my gaze away from the old man and walk on, I meet two boys sitting on a paper plane. At another turn, I find a nondescript car park brightened up by a hummingbird in flight. The Chinese associate hummingbirds with happiness or something pleasant. 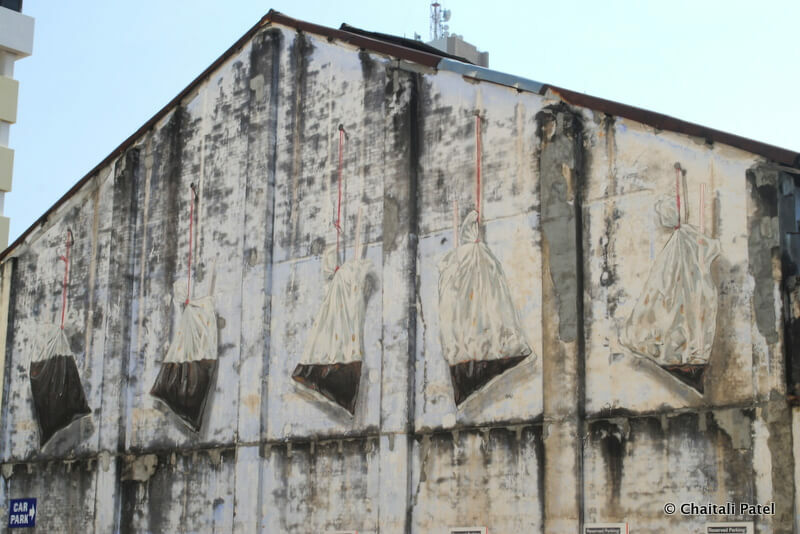 Ipoh and its residents made their fortunes from the tin-mining industry and a mural depicting this trade of yore was rather befitting. 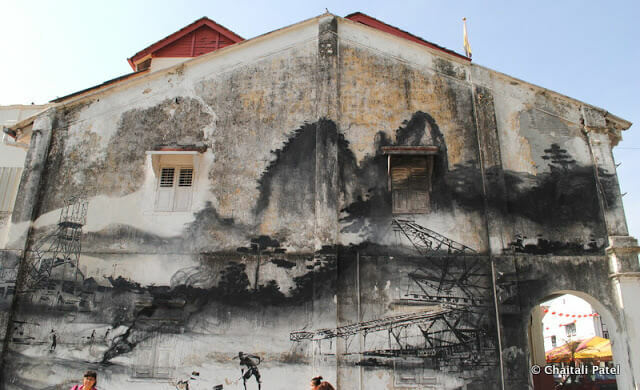 Possibly the largest and most intricate, this mural, painted in a Chinese style, depicts a dredge with chimneys billowing smoke and men toiling in an ancient Ipoh. Of the seven murals, the most intriguing are Zacharevic’s 3D creations that spring to life the minute you set your eyes on them. A little girl stands atop a pile of books on a red plastic stool, reaching up to touch birds in a cage. An actual plastic stool, a metal cage and books half embedded into the wall create a fantastic 3D illusion. A little further, three men sit around a barrel sharing beers and good times. People across Malaysia come to Ipoh to savour mouthwatering local delicacies and revel in the city’s laid back atmosphere. Hor Fun or silky smooth rice noodles topped with shredded chicken and served in a light chicken or shrimp broth is one of Ipoh’s specialties. Efforts are being made to restore Ipoh’s Old Town to some of its former glory and the murals have certainly helped put the city on the world’s street art map. Local artists continue to add to Zacharevic’s work. Among the additions, Marilyn Monroe’s mural at the start of Monroe’s Place is the most noteworthy. Two boys chase Marilyn as she seems to get away on her bicycle. On a corner turn from here one finds the city’s hippest hangout area where quaint cafes and shops selling vintage ware and handicrafts have sprung up between and underneath a maze of tentacle-like roots of ancient trees. GETTING THERE: Malaysian Airlines operates daily flights to Ipoh from Kuala Lumpur. Firefly operates daily flights to and from Singapore’s Changi International Airport. Ipoh is a two-hour drive from Kuala Lumpur and can be reached by taxi or buses that ply between the two cities at regular intervals. Trains also connect the two cities and run and frequent intervals. BEST TIME TO VISIT: Ipoh experiences moderate temperatures between 20 and 30oC year round. While it can rain almost every day, peak monsoon months are October to December. 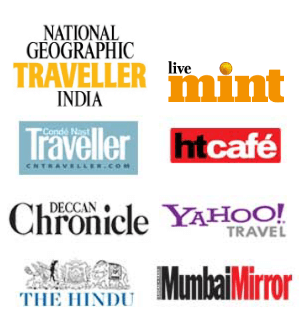 This story was published in the Sunday Mumbai Mirror on the 31st of May, 2015 as Brewing Art. Love that Wall Art. 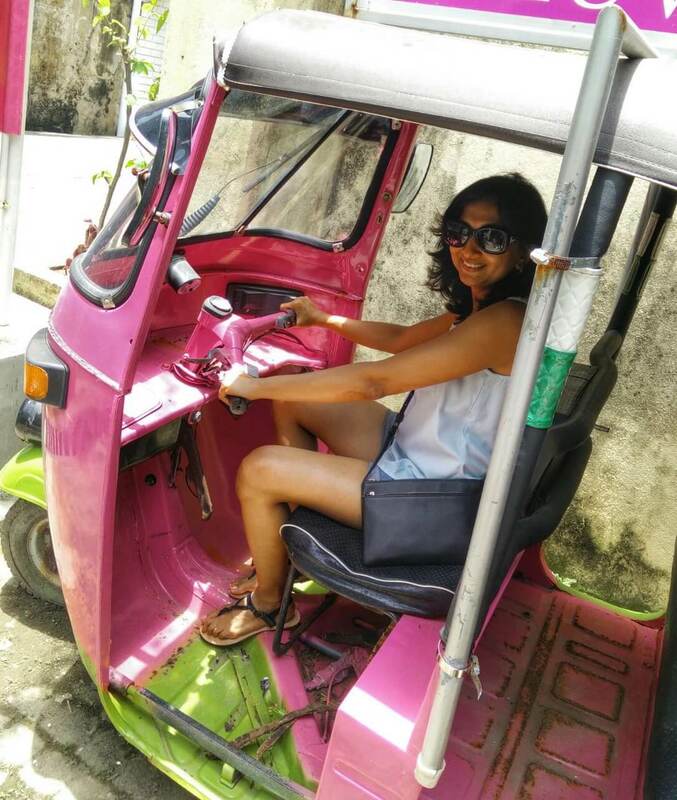 Was in Malaysia, but hadn't heard about ipoh! I have been to Ipoh but missed this one. It takes a lot time & imagination to do this kind of painting. Isn't it? Each one of them is competing with the other. Nice to know about it. Thanks for sharing. Thanks Nisha! Maybe you can catch it on your next visit to Ipoh! Very interesting post.Like all the paintings.Love especially the Zacharevic's 3D one.Thanks for sharing.